Evaluation: Quick scoring point man that is a great defender. “Speedy” is a pure shooter with NBA range and shoots the ball with confidence off the catch or bounce. Fast feet and faster hands earned him his nickname and enable him to pressure opposing ballhandlers. Josh has a solid handle himself and is adept at using his body and change of direction moves to create space, where he is very good at finishing at the rim. He can be rattled by pesky defenders but is improving at slowing down and making the right play. Bottom Line: Josh has the athleticism and game to play college ball at the Division I level. 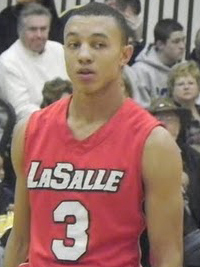 He is a high character kid who really competes which will benefit him in his recruitment. Some might question if he is a pure PG but his shooting touch and defensive abilities make him a commodity for college coaches. Notes: Committed to the Univ. of Toledo in early March.